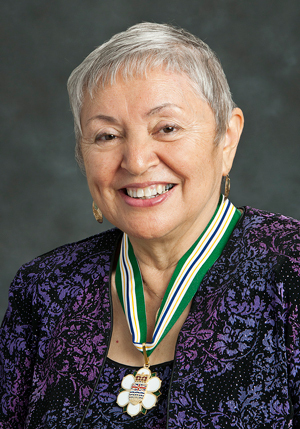 Pauline Waterfall is a member of the Heiltsuk Nation, a proud ambassador for her people, and an advocate of access to education for all First Nations people. For 35 years, Mrs. Waterfall has worked to establish adult learning centres in Bella Bella. This work has resulted in the Waglisla Adult Learning Centre, which offers adult upgrading; and Heiltsuk College, which offers post-secondary courses. These two centres have taught three generations and more than 600 Heiltsuk people. Approximately 21 per cent of students going through the Adult Learning Centre have transitioned to public post-secondary institutions in the past decade. Mrs. Waterfall has also served as is a founding member of the Indigenous Adult and Higher Learning Association, which represents 36 adult and higher learning First Nation institutes in the province. She is a former Chair of the Board and currently serves as Treasurer. Mrs Waterfall is known as a “keeper of the knowledge” in her community. She has documented Heiltsuk history and customs, written articles, gathered knowledge on traditional foods and medicines, and is frequently called upon as an orator in cultural ceremonies and events. She has played a significant role in revitalizing the Hailhzaqv language. This work is especially important as only three per cent of the Heiltsuk people are fluent speakers today. Mrs. Waterfall has remained true to her Heiltsuk name, Hilistis, which means “starting a journey and staying on course to complete and coming full circle”.